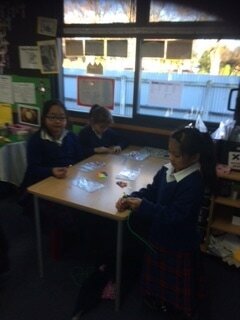 Kiwi 8 are learning how to knit peggy squares this term. 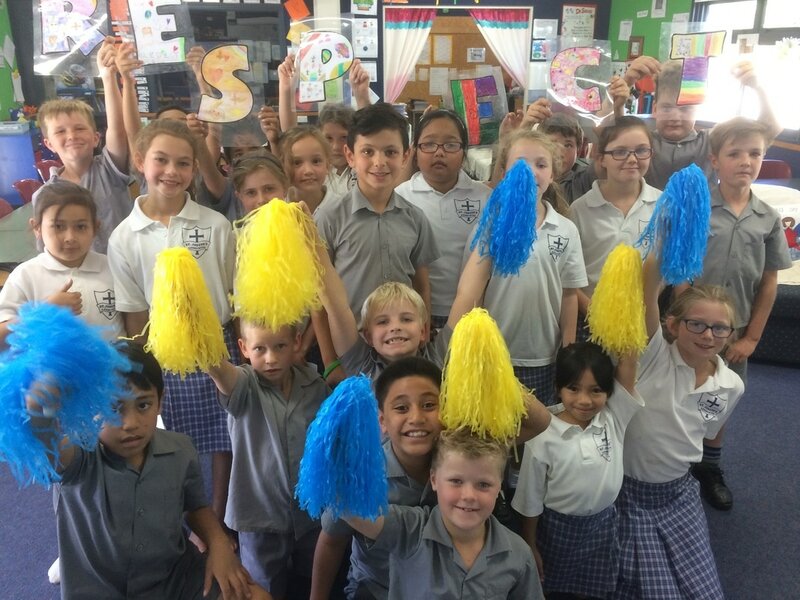 Generosity is one of our school virtues for this term, and Service has been a school wide focus this term. The peggy squares will be presented to Donna at St Vincent de Paul Society who will make them into a blanket for people who are needing warmth. This is a creative way for the children to learn about doing service to help others. Wool and needles were all donated by a team of wonderful people, family members, Waste busters, neighbours and Vinnies. I wonder how many peggy squares we manage to knit! We would love helpers each week to continue our mission....if you would like to help us the peggy squares are 30 stitches wide and about 20 cm in length. There is plenty of wool available if required! 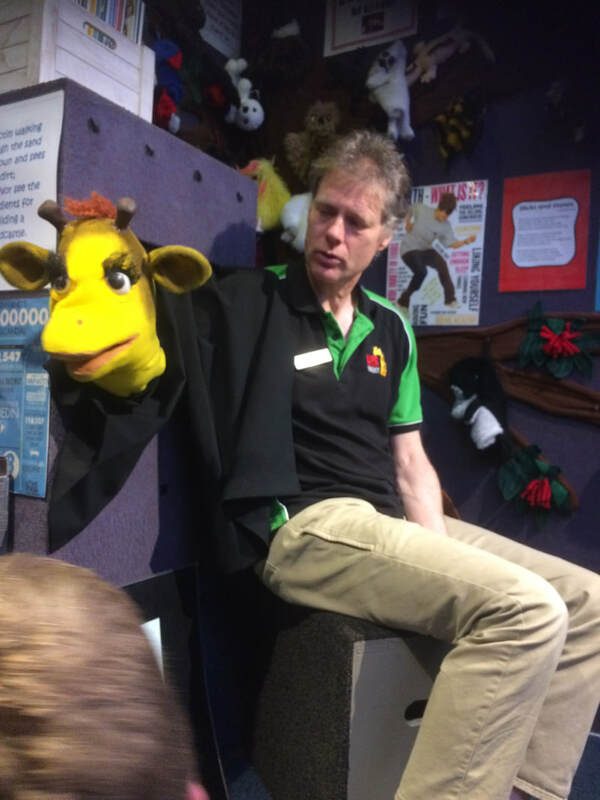 Life Education Van - Space Invaders - learning about our body and how to stay healthy with Harold the Giraffe! 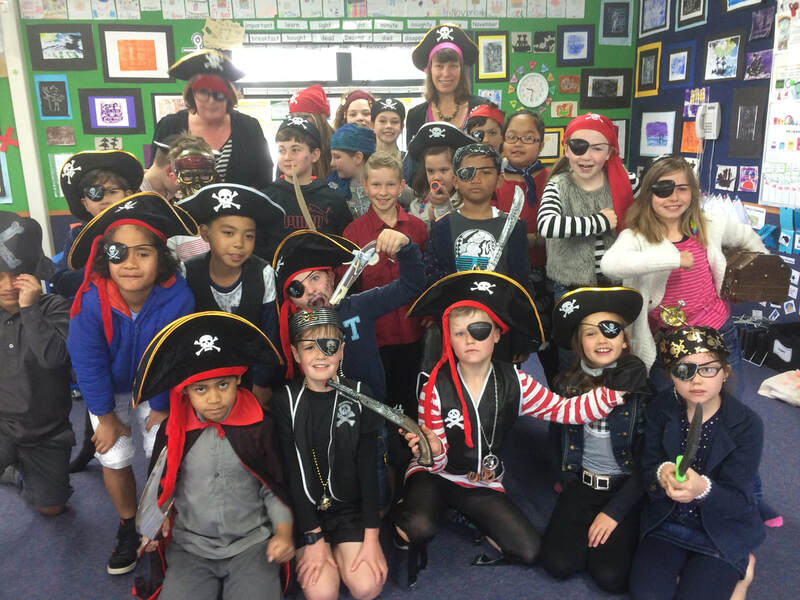 We all went a little bit pirate in the last week of Term 3! 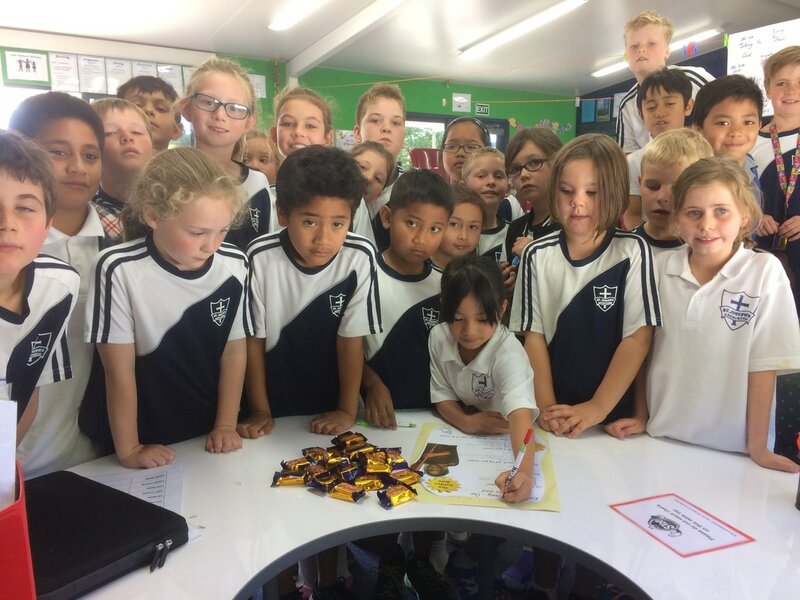 The school raised $300 for the Heart Foundation. Here is Kiwi 8 dressed in red ready for action and in front of the donations they made today. Well done Kiwi 8. 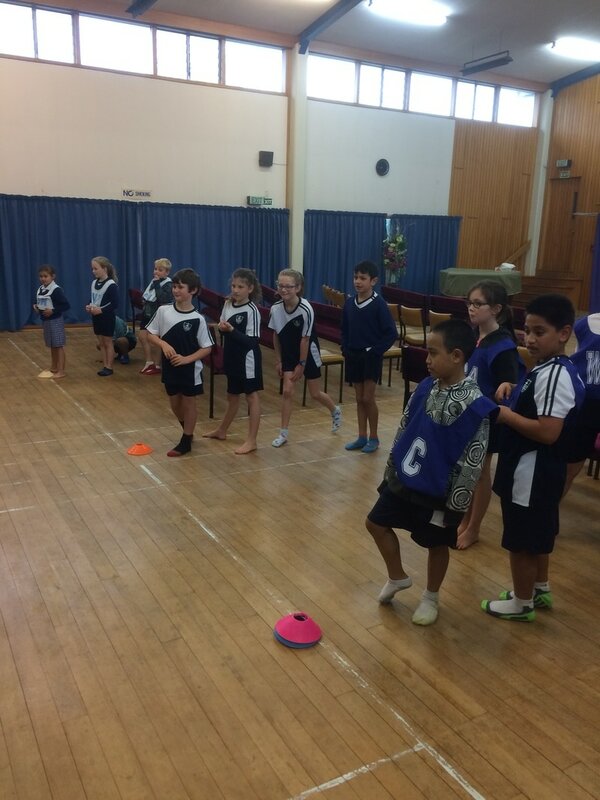 You were all very generous and kind and also jumped very well in all of the activities in the afternoon! 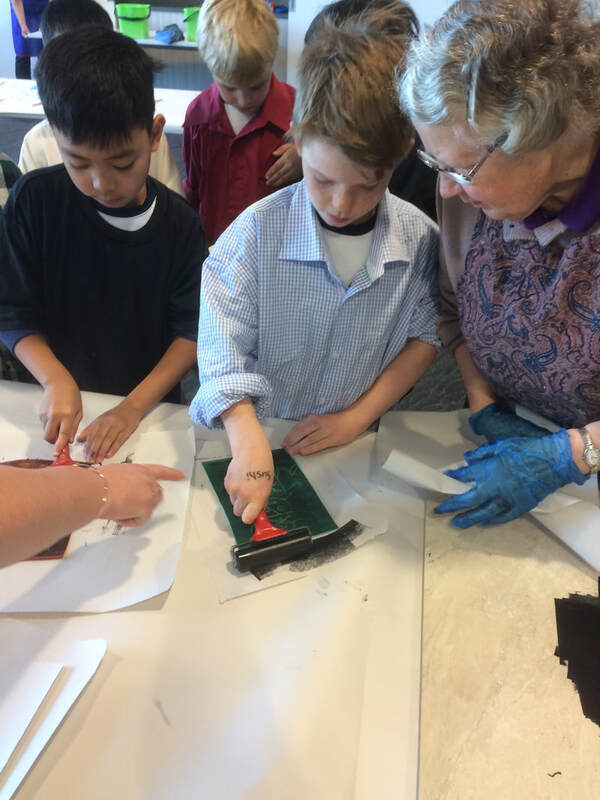 Kiwi 8 Students busy preparing their printmaking plates for our next visit to the Art Gallery. 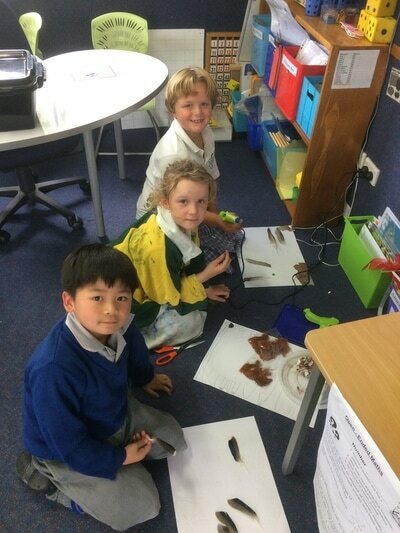 They have been busy creating cardboard prints of pirate ships, string, rubber band and card plates of anything related to our Ocean Theme for Visual Art and a third piece using PVA glue to create an image. It will be exciting to see how our prints turn out after our session at the Art Gallery on Thursday 24 August. Feel free to visit our room to view the children's wonderful creations. 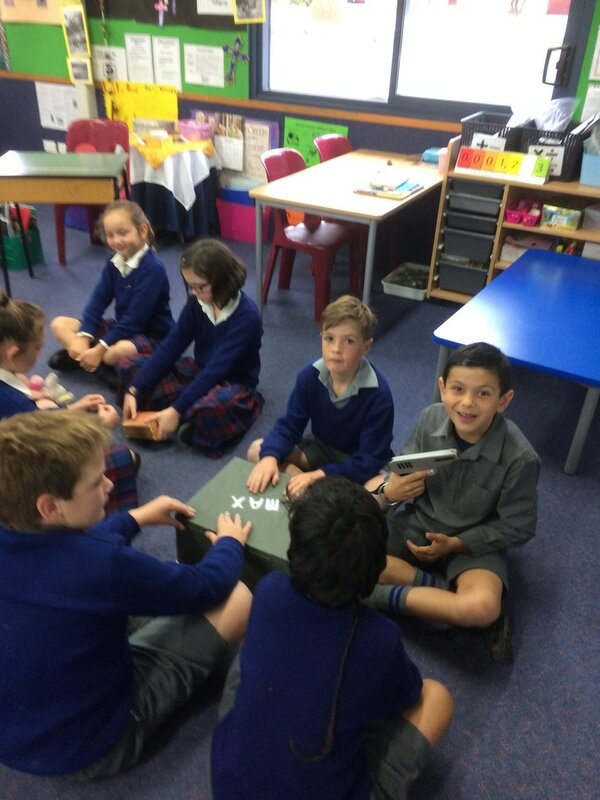 Kiwi 8 students are enjoying the pirate theme so far this term. Part of the Literacy work has involved creating a pirate alias and writing a personal description for their pirate character. Their next activity is to write a narrative involving their pirate character and one other pirate from our room. 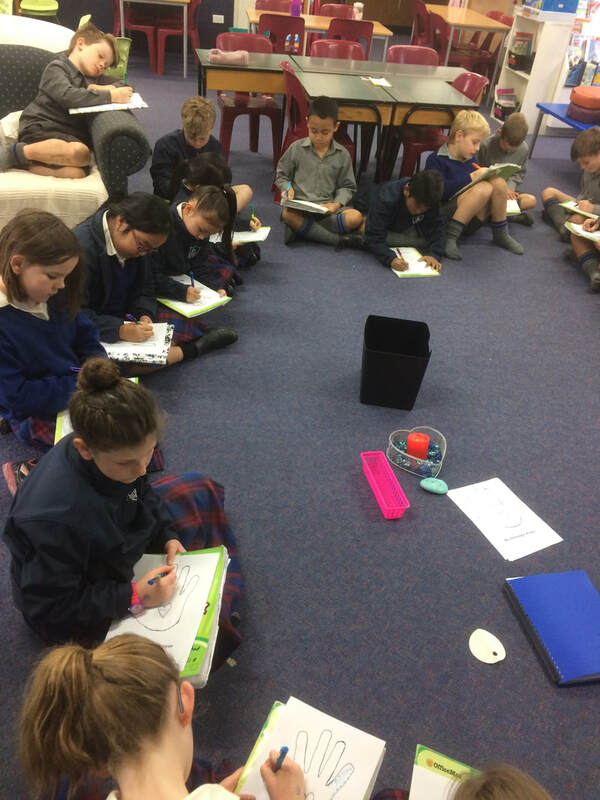 Watch this space for some more more fabulous writing. 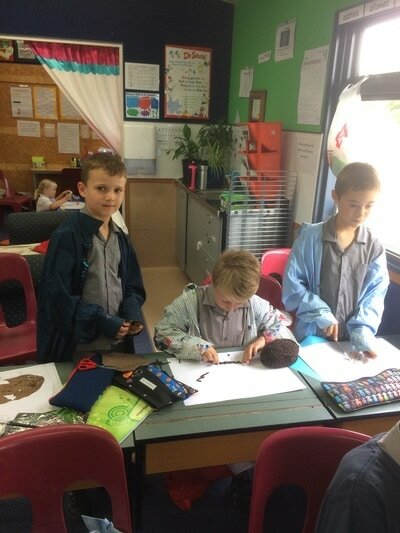 You are most welcome to visit our class where you will find pirate portraits and drawings for each pirate character along with a book of published pirate descriptions. Hi. My name is Tall Tide Merrick. I like to find treasure because it makes me happy. When I find treasure such as diamonds and gold I am very pleased. “Shiver me timbers”, when I find gold. I wear a golden pirate hat. I crafted my hat from gold I found in a special secret place. I have blue eyes and a green beard painted so my crew like me. I wear a golden hook because I lost my hand in a battle. I have one leg because my leg was eaten by a shark when I fell in the water one day. I wear an eye patch because it makes me feel tough. I am a mad pirate and I like my pirate friends. Having a good day at sea? My pirate name is Pirate Wooden-head. Let me tell you a little bit about myself. I, me has a wooden head, a pirate patch and a very sharp sword. I am very mean, so watch out because you could be walking the plank or scrubbing the poop deck! I order you around, I fight, I demand and I get money off pirates. I also kill pirates so you had better do what I want you to do. Sometimes I get scared because we fight and some of my crew members die. Sometimes I think I might die and that the other pirates will get my treasure that my crew have stolen. What does Miss Treasure Hog do? Miss Treasure Hog is my name. I hog treasure so no one can get it and if any treasure is gone you will not be left alive! Be warned. What does Miss Treasure Hog say? How does Miss Treasure Hog feel? I am a happy pirate because I have a good crew to sail with. I am also very happy because I keep all the treasure safe. When I find new treasure to hog I feel excited. What does Miss Treasure Hog look like? I have one eye and my shirt is made from money. My nose is pierced and my shoes are pink and have gems on them. I always wear colourful socks. I wear blue jeans with jewellery in my pockets. I wear a hat or a scarf to cover my missing eye. My name is Captain Blue-tip. I tell my crew what to do but I am a nice Captain. I wear a blue scarf on my head and a red top with zig-zags. I have brown boots with a skull on them. I am tall and carry a sharp sword across my back. I tie it with a rope. I also wear a black skirt because black is my favourite pirate colour. I find treasure and teach the young pirates to sail the ship. I also train them how to find new pirates. When I am happy I say, “Ahoy me hearties” and “Shiver me timbers” when I am feeling cross or surprised. I feel happy when I am finding treasure but when I am mad l shout loudly! “Ahoy me hearties’’. My name is Emerald Ally and I seek emerald jewels from all over the world. I am like the ‘Queen of Emerald Jewels’. I like to steal emeralds from Captain Stone because she steals heaps of jewels when she sails. I sail the seven seas with my pirate friends and pirate boss Captain Holy Stone. When I am on the pirate ship I get my telescope out to look across sea and land for emerald jewels. My friend Captain Stone likes to seek jewels like me, but every kind of jewel. I may be a bad pirate but I like to help my pirate friends out. I steal the treasure chests and get as many emeralds as possible from the chests. I am known to say “walk the plank’’, “Arr! I be seeing emeralds!” and “They be pretty gems”. “Oh yes, that would make me feel very happy’’. I wear a velvet green emerald dress, a brown soft three quarter jacket and dark sparkling emerald jewellery. I wear navy boots and a black pirate hat with a skull. I also wear a black scarf around my waist and navy blue tights.I have brown blondish curly hair with emerald green eyes. 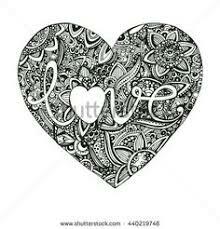 Continuing with our Visual Art theme this week - Kiwi 8 spent time Zentangling during prayer - thinking about their family and friends as they zentangled. 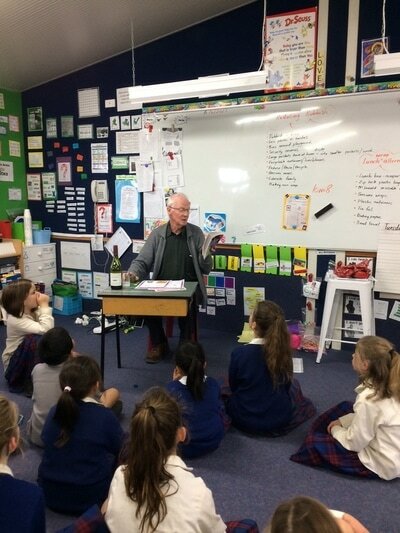 As part of our Ocean Art study for Visual Art this term, Kiwi 8 have been enjoying the books by New Zealand author and illustrator David Elliot. 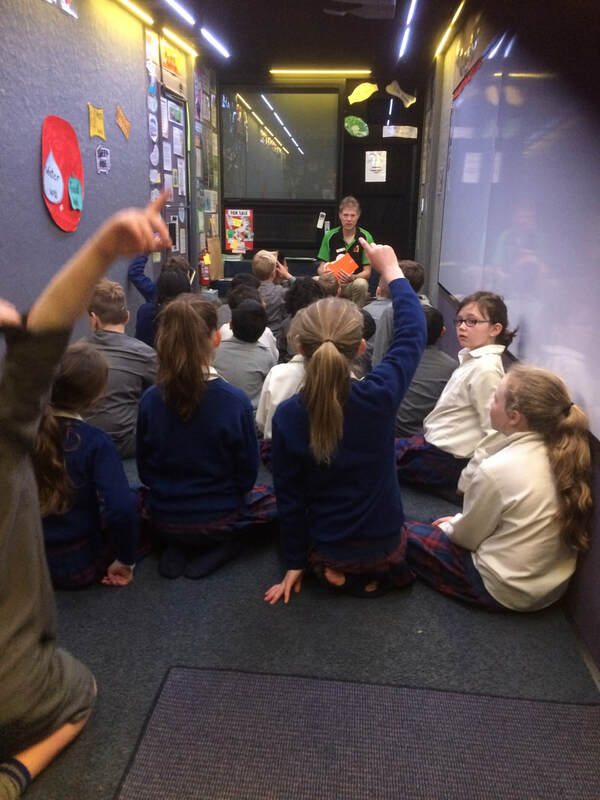 We spent an hour at the Art Gallery in Week 2 learning about his illustrations and how he created each image. We were very lucky to meet David in person on the 10 th August in Week 3. 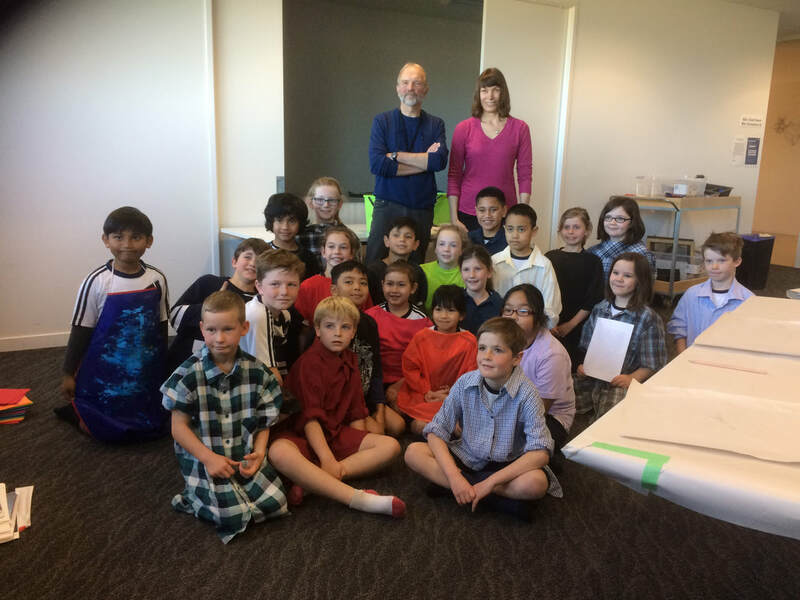 David was passing through Ashburton and happened to be at the Art Gallery during our session for Print Making. 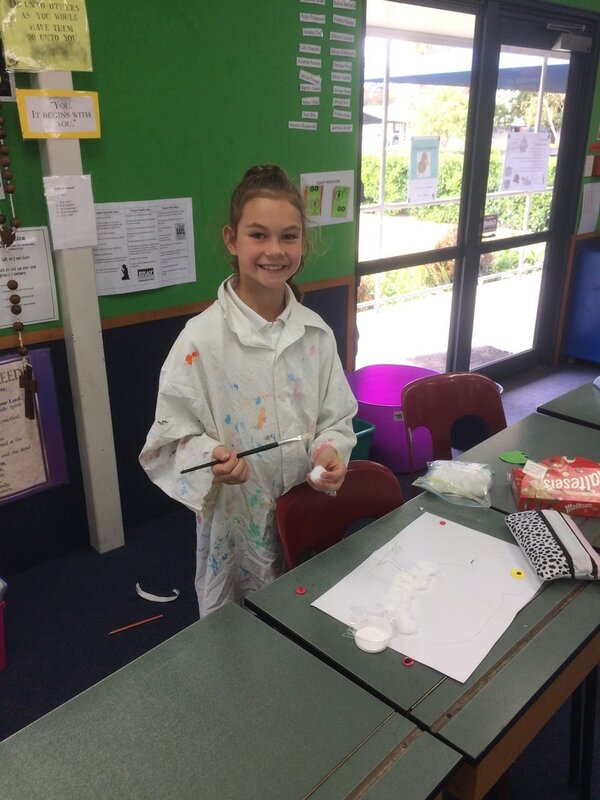 It was a wonderful opportunity for the students to share their knowledge about the elements of Art they have been learning about. David was most impressed. You can visit this website to find out more about David as an author and artist. Kiwi 8 is afloat with pirate art. 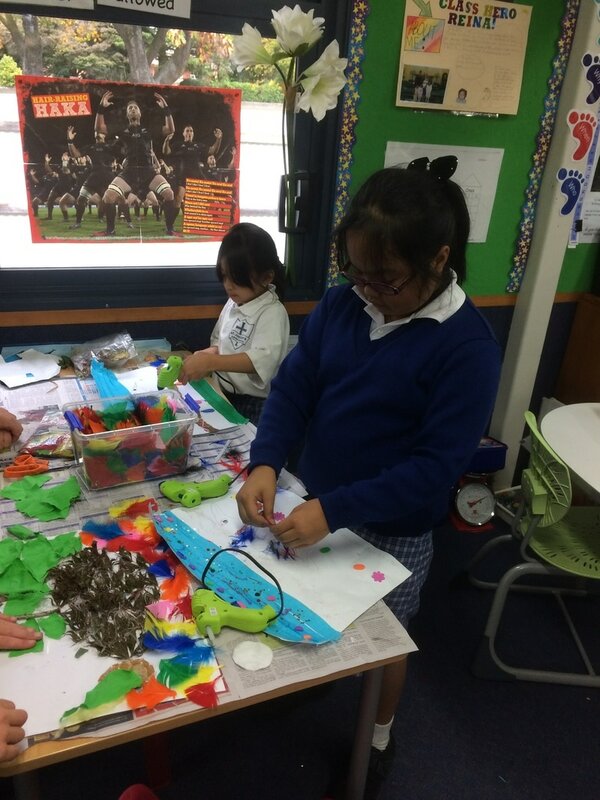 This term involves a Visual Art focus for Topic. 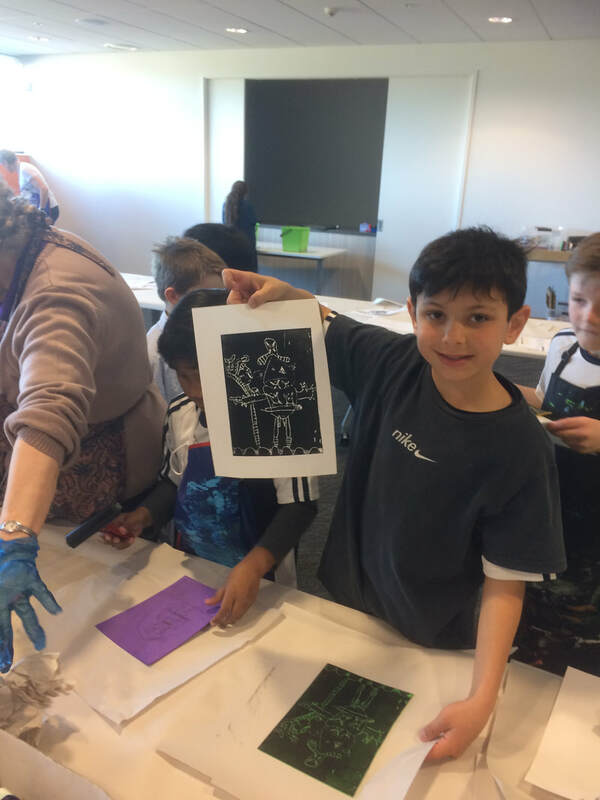 Kiwi 8 has been spending a few hours at the local Art Gallery with Simone who is helping us to learn printmaking techniques. The images below show various stages of the Print Making process from preparing the print, inking, burnishing and finishing to reveal an image. 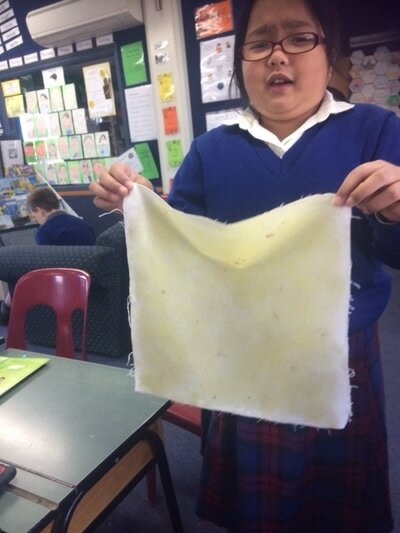 Kiwi 8 students were delighted to find their art printed by using foam and perspex mono-printing methods. 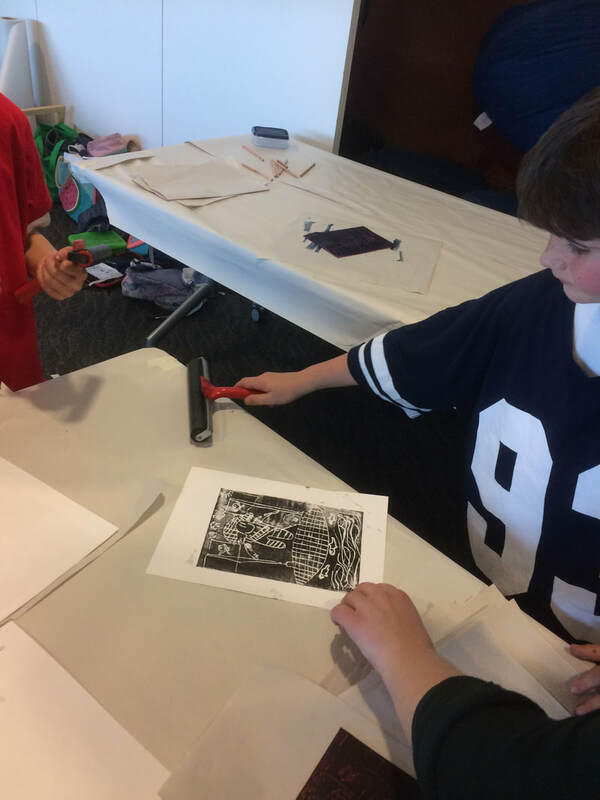 Our next step is to create cardboard plates of pirate boats which will form part of an ocean themed image - all using printmaking techniques. A very long time ago, the disciples of Jesus and some people had gathered to hear a reading. When the reading was finished they all heard a rustling sound in the bushes - it was strong wind. The disciples also felt tongues of fire on their heads. The disciples began talking in different languages. 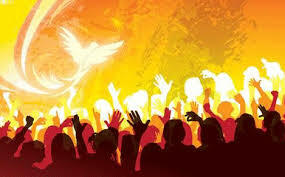 The Holy Spirit came down from Heaven and told the disciples to spread the good news. The disciples were scared to spread the good news because they thought they would get hung up on the cross like Jesus. But they went anyway because they had the Holy Spirit with them. selves into their house. They locked themselves into their house because Jesus died on the cross . They thought that they would go on the cross as well. Somehow fire was on the disciples heads because the Holy Spirit was inside of them. They were speaking in different languages like Hebrew, Aramaic and many others. The whole town came and saw the Jewish people speaking their own home language. Someone said, “they are probably just drunk”. That same day the church was born. A long time ago, the day the church began, the disciples were in a house in Jerusalem. Suddenly, they heard a big gust of wind. Next they started to see tongues of fire on everyone's heads. The disciples all started to talk in all different types of languages because the Holy Spirit was in them. The Holy Spirit did this. The Holy Spirit wanted the disciples to go around the world and teach people about Jesus and God. Everyone sprinted out of the buildings following a big noise, ‘bang, boom, boom!’ Someone was coming but they didn’t know who it was. When they arrived to where the noise was coming from they found out it was the Holy Spirit which announced, “ The sun will turn black and the moon will turn blood red’’, and it did. Everyone truly knew Jesus and God loved them all. 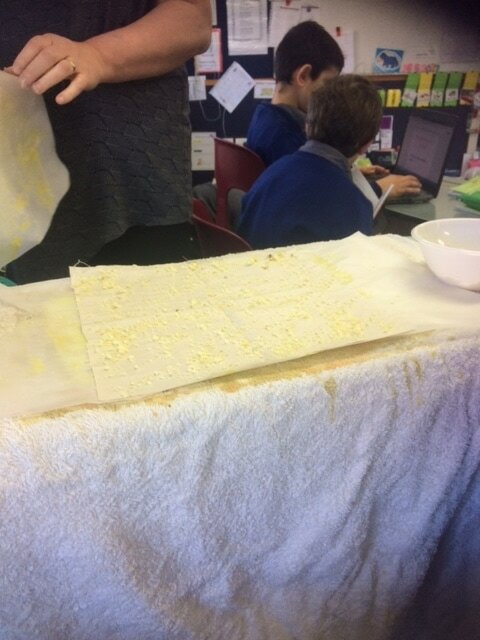 Kiwi 8 children spent an afternoon session making Beeswax wraps in order to stop the amount of rubbish in our school playground. They have been testing the effectiveness of the wrap as an option instead of using glad wrap. 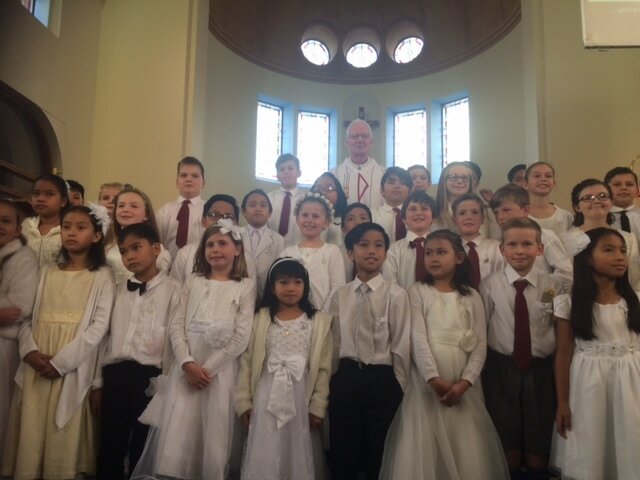 Happy children prepared for their First Holy Communion this year. Well done Kiwi 8 children who participated in this important Sacrament in your journey as a child of God. 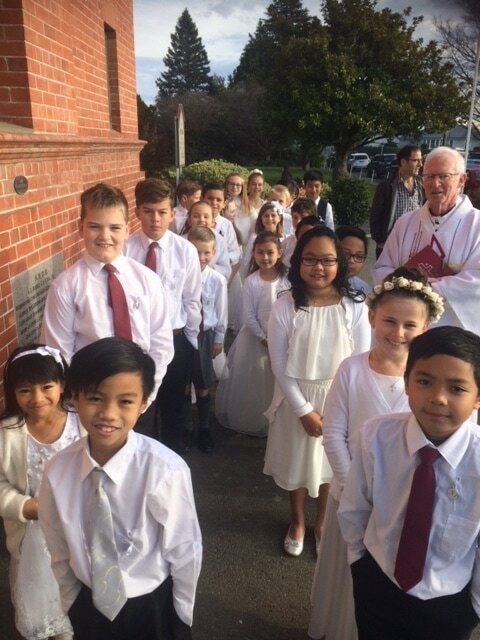 You all looked so smart in your lovely white clothes and behaved very respectfully. 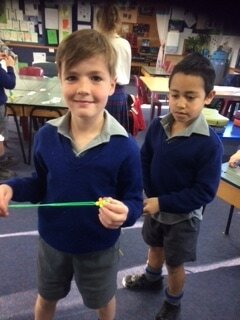 Kiwi 8 spent time studying the Rosary and how to make Rosary Beads. 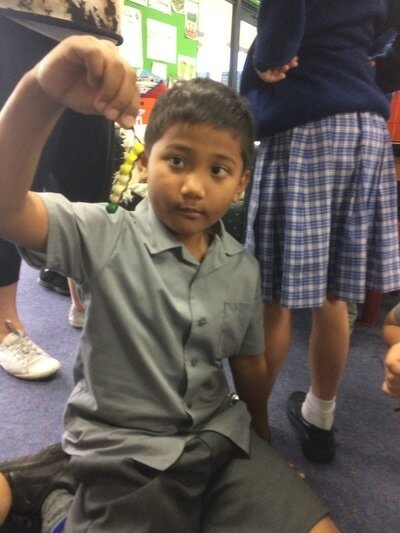 With Mrs. Rowlands assistance and help from Elyse in Takahe the children all went home with a set of Rosary Beads made from Pony Beads. 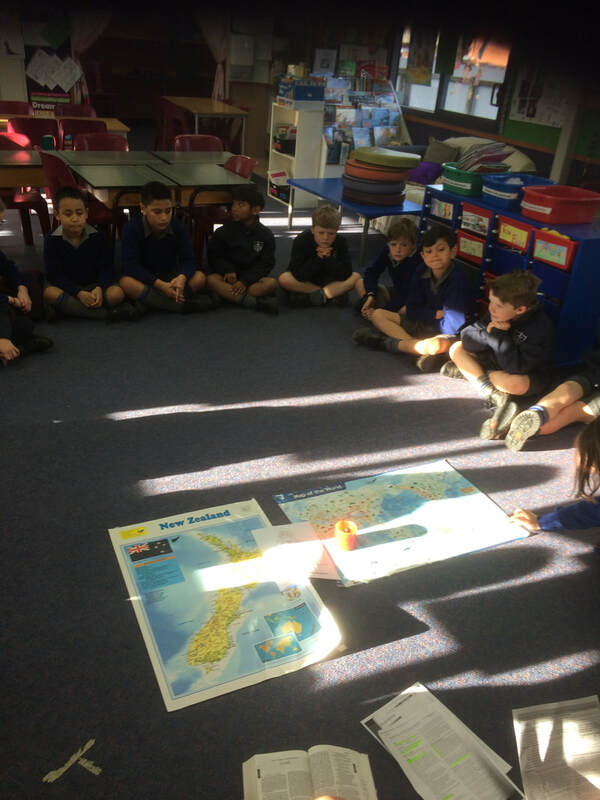 This term for Religious Education Kiwi 8 are learning about God and how all he has created is Tapu and to be respected. 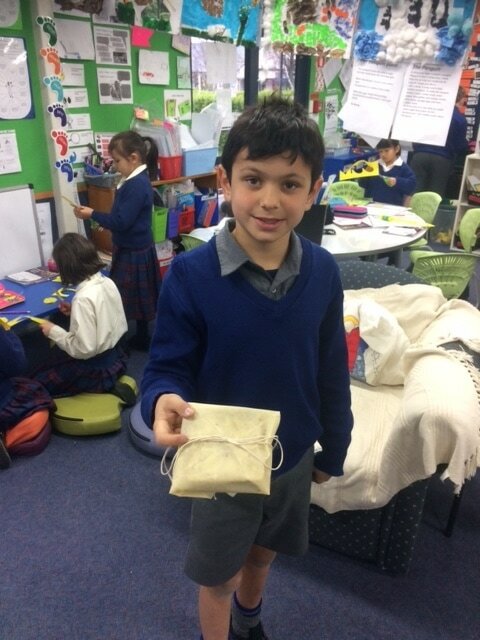 The children were invited to bring along some special items to share with one another. They spent time sharing their treasures, explaining to their peers why they were special to them. We all have things that we value and consider to be special. It was great to see such a collection of items. 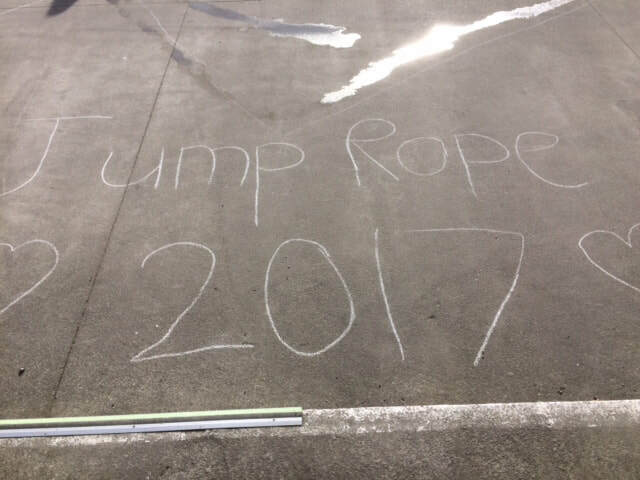 Well done Kiwi 8 for being organised with this. On Friday of Week 2 we had a special visitor to Kiwi 8. 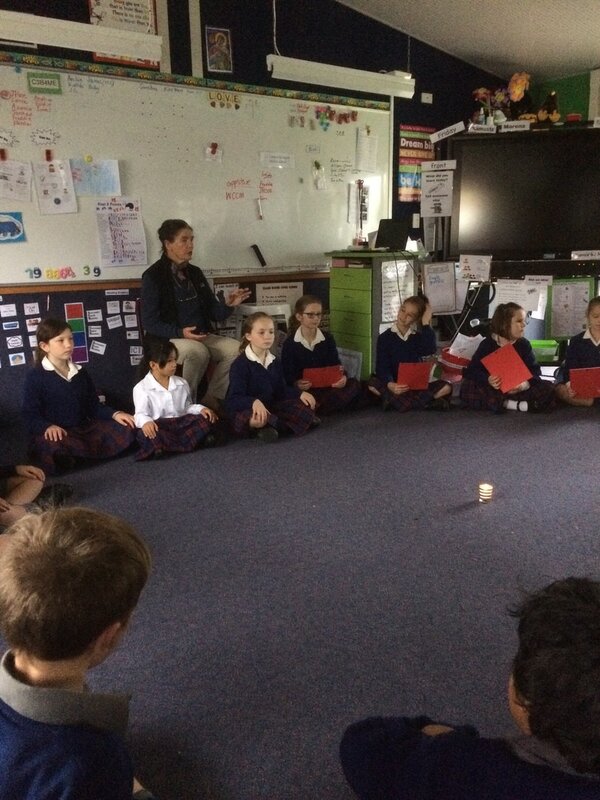 Jane travelled down to spend time in classrooms, teaching us all how to spend time in meditation. Jane talked to us all about how important it is to slow down and take time in our busy days. 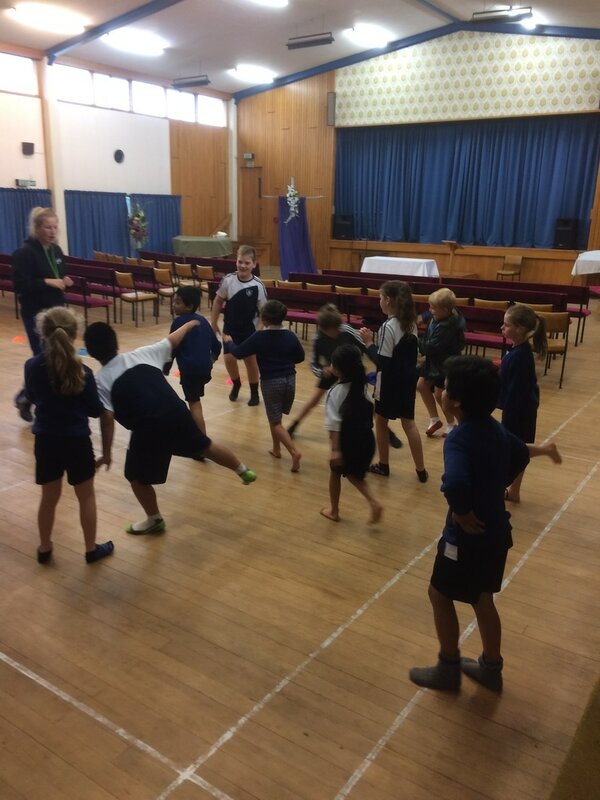 Jane was most impressed by Kiwi 8 children's attention and focus during the session. On Monday 8th May the whole class went with the school to watch a performance by The Playhouse actors titled 'Puss n Boots - Pet Detective' . 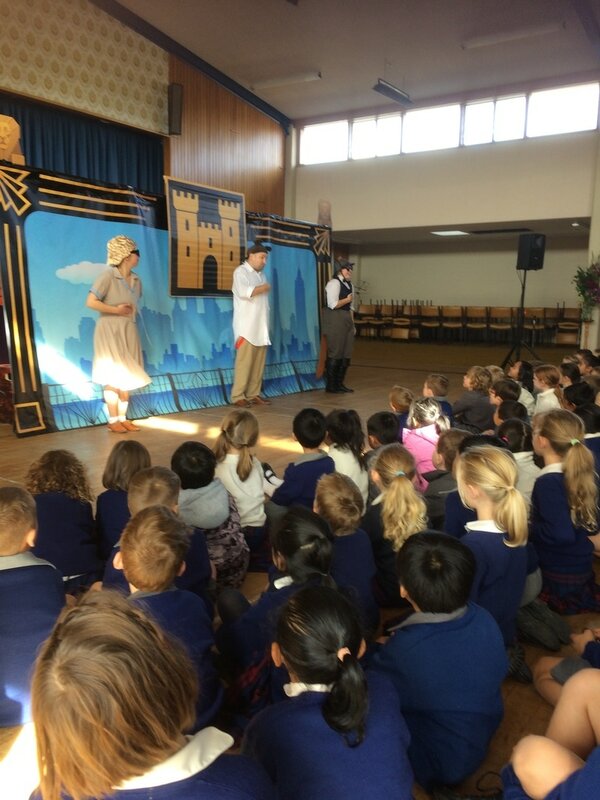 On Tuesday the 9th May students listened to another adaptation of the story Puss N Boots. After listening to the story the children spent time mapping the main parts by drawing little sketches. Watch this space for more Story Telling action as the children develop skills to become good storytellers and story writers! Reina and Orpahenjoying reading together. 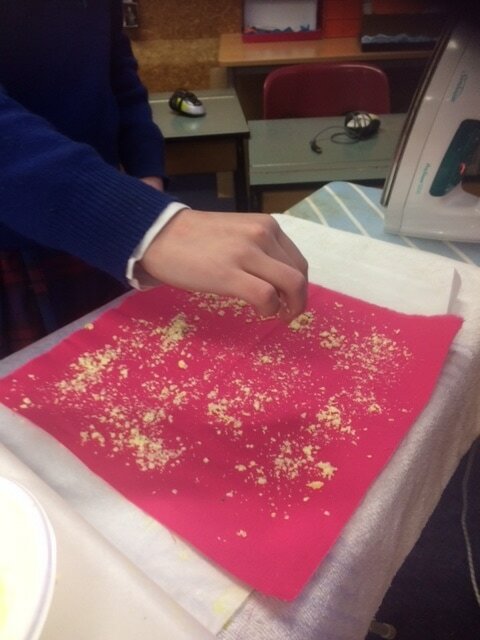 It is great to have this help from our Senior school students. 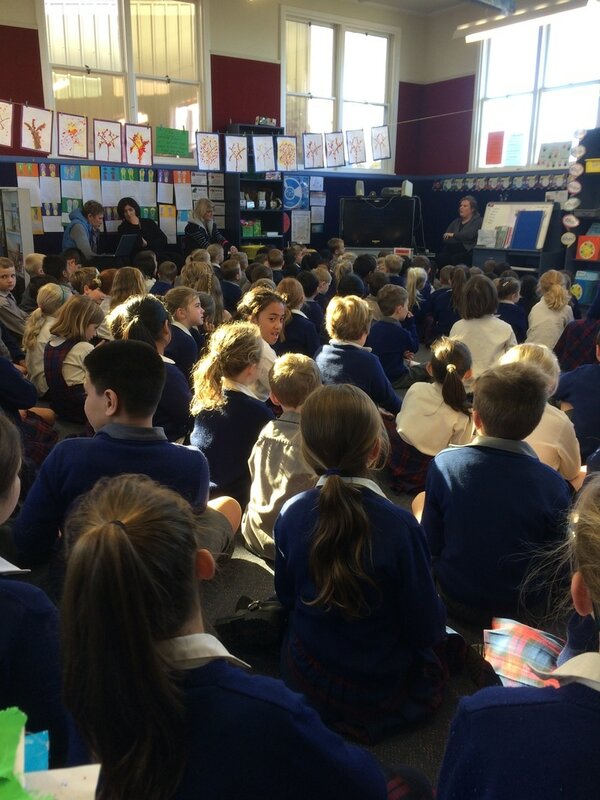 On Friday the 5 May we attended Kiwi Team's Assembly. 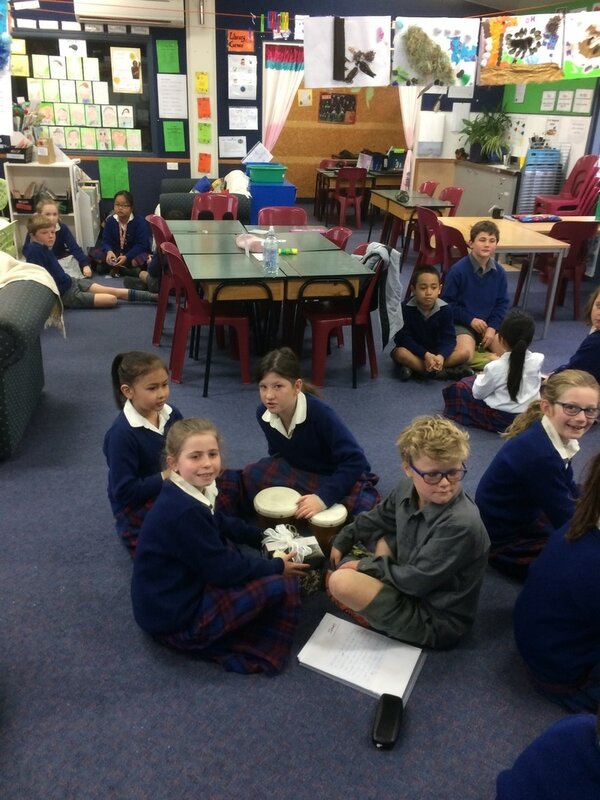 ​Assembly is a great time to gather together, share work and celebrate together. 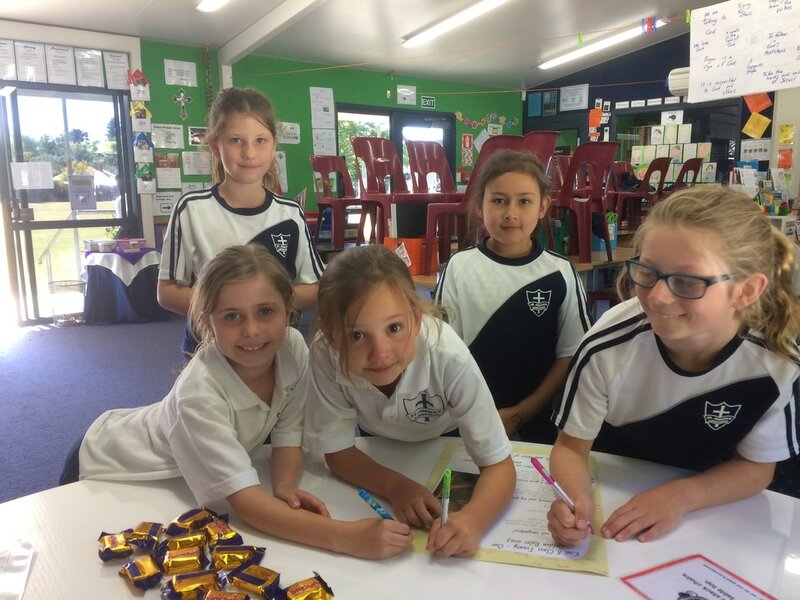 Kiwi 8 at Sport on Thursday - the last day of Term. Great team fun inside the Sinclair Centre due to the rain. 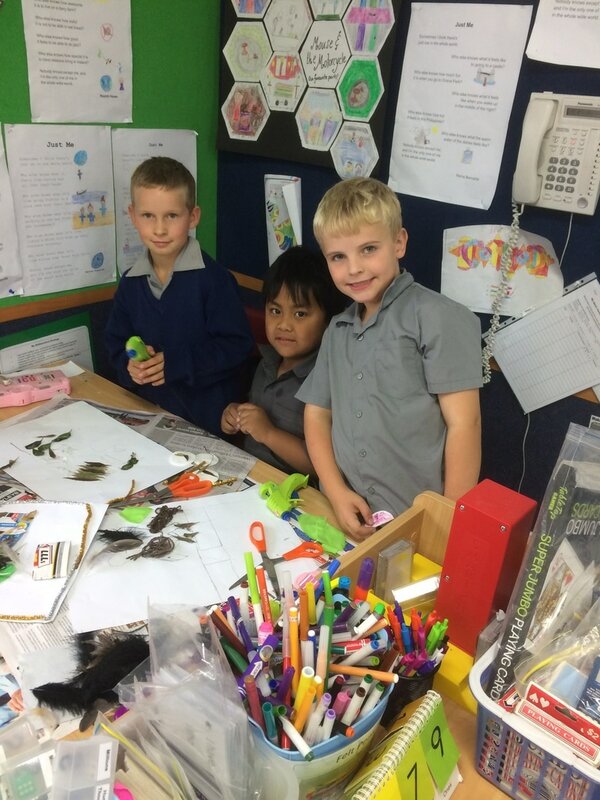 Kiwi 8 and Kiwi 4 children busy during Discovery Time making Native birds. ​finished string of Good Deed Beads. 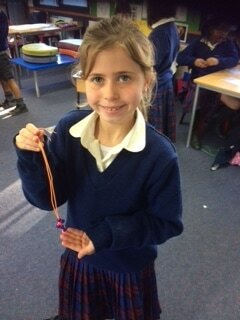 At school this week students in Kiwi 8 all made a string of ‘good deed beads’. It was fun but it was really tricky! Whenever we use our manners, help the teacher, or others we can put a bead up or down. 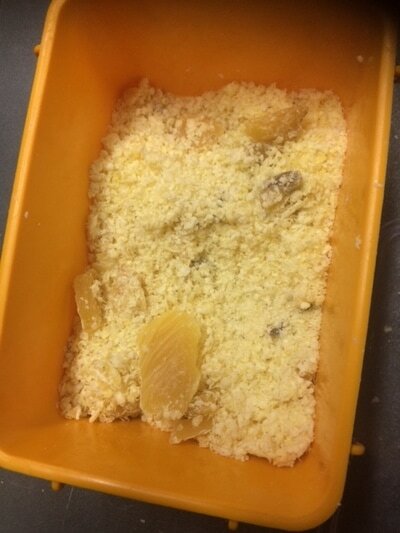 I will teach you how to make some. Tie a knot at one end - not too big. If you want to burn the two edges of the string. You don’t have to. When you have as many beads threaded as you are using (depending on how long your string is ) tie another knot to keep the beads attached. Get your safety pin and put it in the first knot you made and pin the good deed beads anywhere you want so you can use them easily each day. 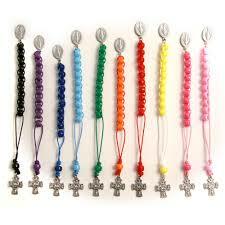 Tip if you have 10 beads you could bring them wherever you go and when you are feeling down you can pray the rosary. Your good deed beads will look a little like this. 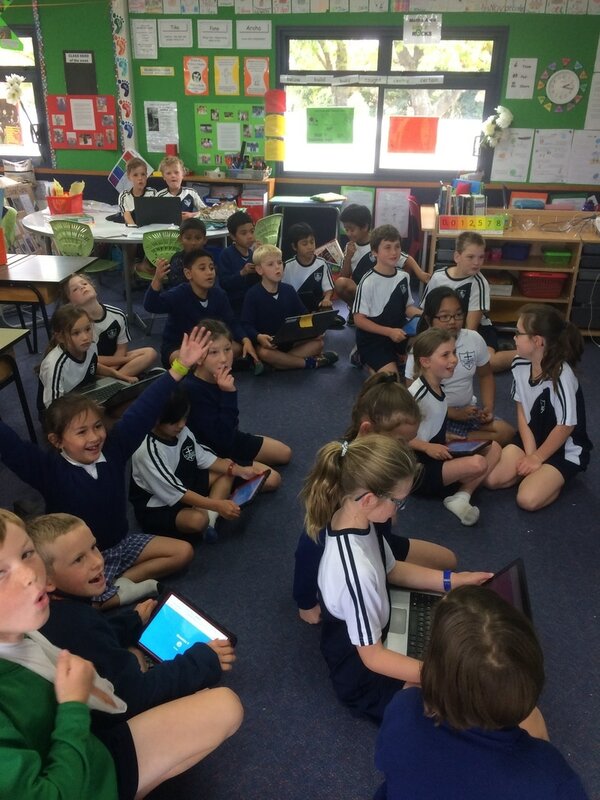 This week in Maths time one of the Kiwi 8 students created a Basic Fact Kahoot for the class members to play. 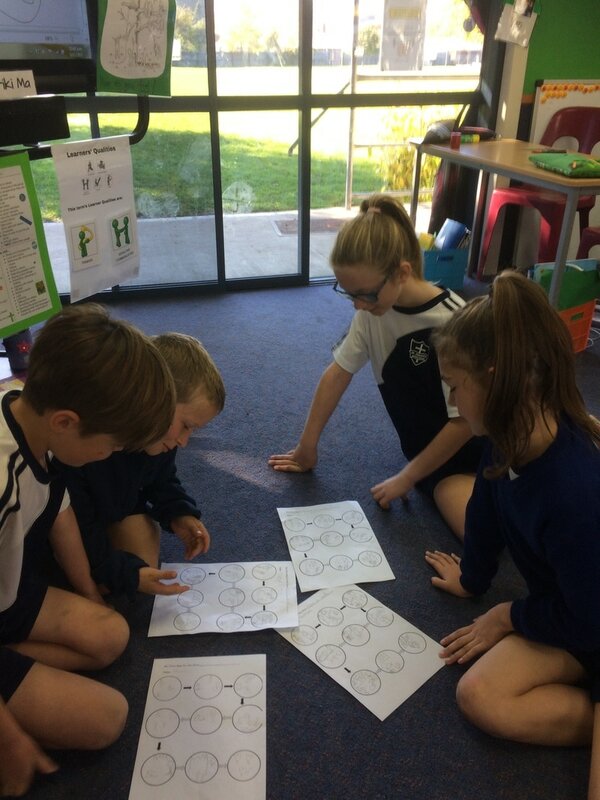 The students worked in pairs to see how many of the 20 questions they could answer. 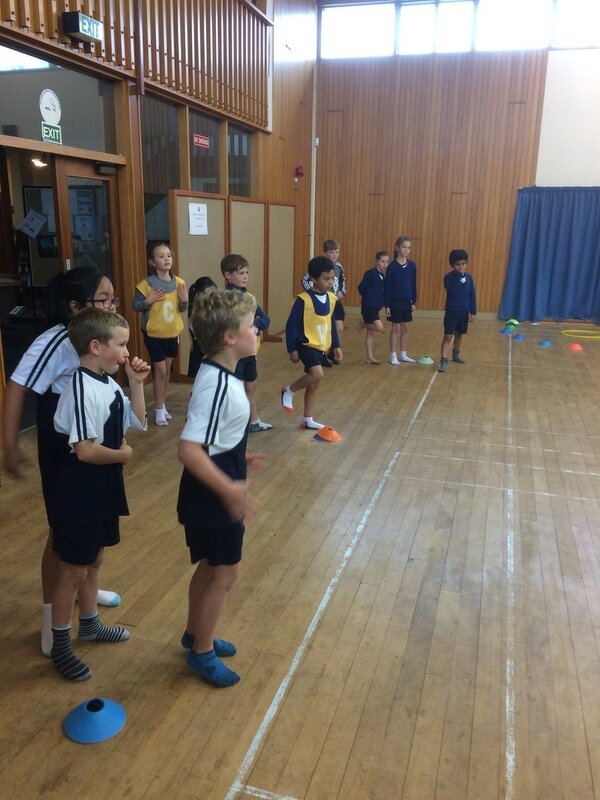 There was plenty of noise, friendly competition and excitement when the teams answered correctly or passed another team in the points scored. ​The winning team is in charge of designing the next Kahoot Quiz. Kahoot is a fantastic way to revise skills and knowledge. 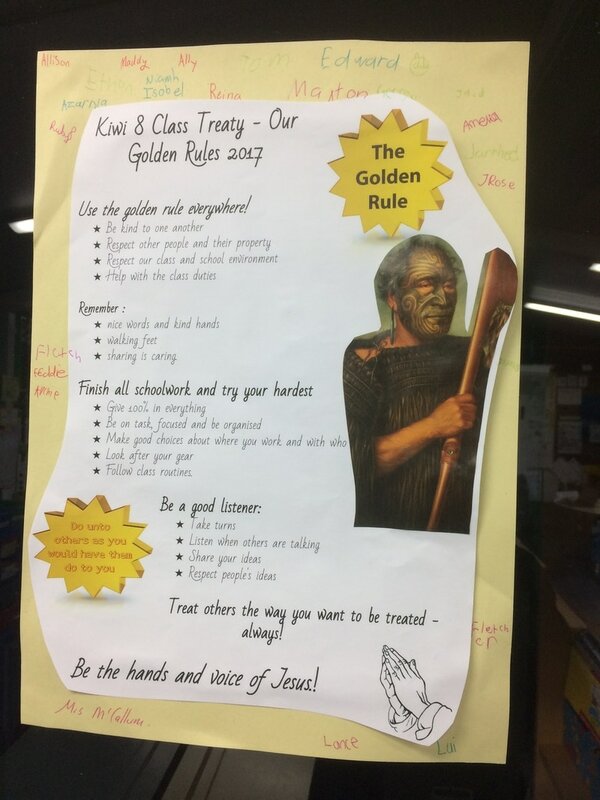 This term Kiwi 8 have been busy working on our class Golden Rules and Treaty. We had our signing ceremony on Friday 10 March. The children are all trying hard to remember how to 'treat others the way they would like to be treated'. We celebrated the special signing with golden chocolate bars. ​In the weekend I went to the Weetbix Tryathlon. It is the 25th Year. It was a swim, bike and run. The swim was two lengths, the bike was two and a half kilometres and the run was two and half kilometres as well. I was not very good at the swim but I made it up on my bike. It was raining while I was on my bike, and on the run. I could not find where to put my bike then a lot of people passed me. I got a lot of free things like... a spy pen, a beach ball and a medal. At the prize giving it was raining really hard. My favourite part was biking and the swim. In the weekend I went to the Weet-Bix Tryathlon Championship. It was so much fun because we got to swim, bike and run. When I came out of the the pool all of the mum's and dad's in the St. Joseph's School area cheered for us. When I came out of the pool I had to do 2.5 kilometres and when I finished the bike ride I had a 2.5 kilometre run. There were a lot of people telling everyone how to go the right way. For the bike you had to run your bike up a hill and you had to wait to get on your bike. There were some red posters when you got to them at the end and the start that were where you had to get off your bike and then get back on your bike. I got my medal from Richie McCaw's wife. There were heaps of tents and heaps of kids at the Tryathlon. When were doing the prize giving we had to cheer for the last person to finish. 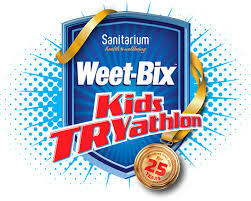 That was the Weet-Bix Tryathlon. What I wish I did in the weekend. In the weekend I wish I woke up at 5 o'clock in the morning, packed my bag as full as can be with swimming togs, goggles, water bottle, some snacks and my towel. When we got there I wish I put on my togs and started swimming as fast as I could possibly go. After that I wish I hopped on my bike, peddled as fast as my little legs could go and finally started running. I wish I came first and got a gold medal. Then I wish I had a huge drink, a packet of chips and some biscuits. 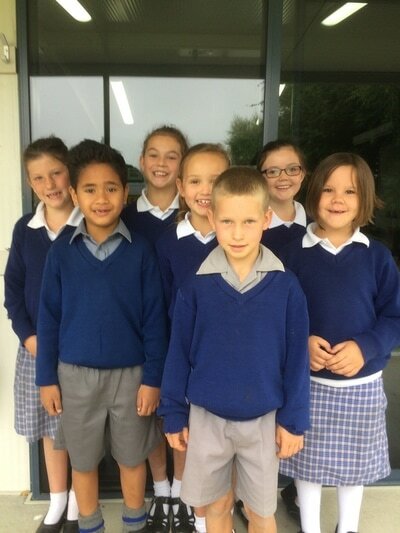 Kiwi 8 students were in charge of leading School Assembly Prayers. The image below shows the students preparing. They did a great job remembering their words and the role they had to play. Our prayer message was about RESPECT, the school virtue we have been busy focusing on for the last four weeks in class and Family Group Prayers. 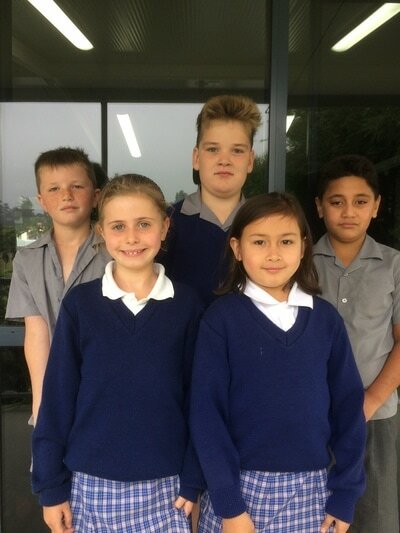 Well done Kiwi 8 students! You are RESPECT stars! Students from Kiwi 4 and 8 have been working during Discovery Time, using an art technique called collage, to create a picture of a native New Zealand bird of their choice. 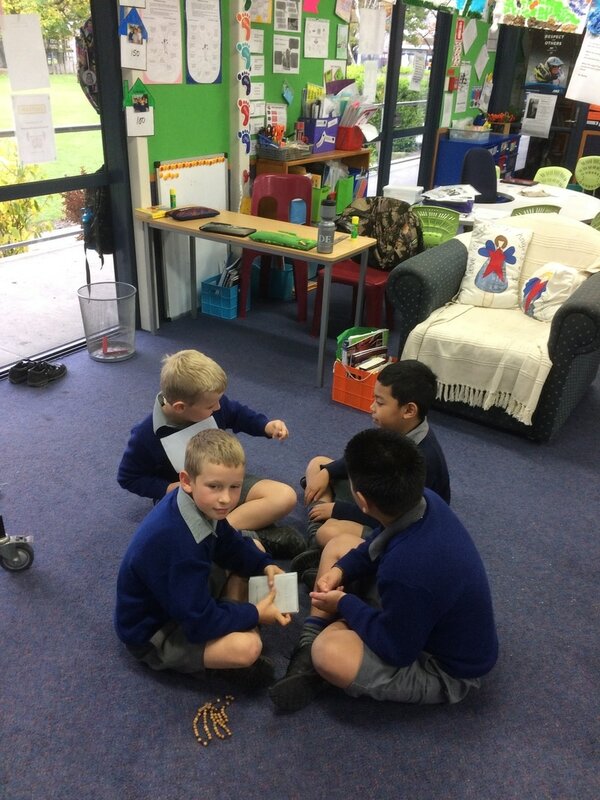 They spent time exploring picture books by Jeannie Baker, looking at her clever collage illustrations, finding out about New Zealand's native birds and planning how they could create a bird picture using some of her techniques. They have been busy collecting feathers, material, craft bits and pieces so they can collage during Discovery time. The process is busy and interesting. The pictures below show the students in Day 3 of their Discovery Journey, starting to create their picture with the materials they have selected. we have explored in Literacy. This is one of the many finished poems. This year we have an extra class member. 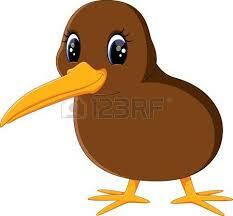 We have our special class mascot called Kiwi bird. 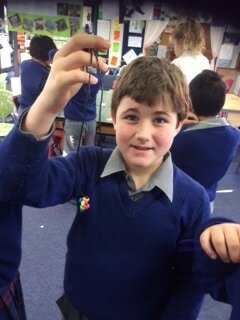 Children will bring Kiwi bird home to meet you - sharing him during the week. Thank you for supporting your students to care for Kiwi bird and record some of the activities he enjoys while enjoying their company. Kiwi Bird on his way home to Allison's house with their class friend Reina. We were learning some tennis ball skills. 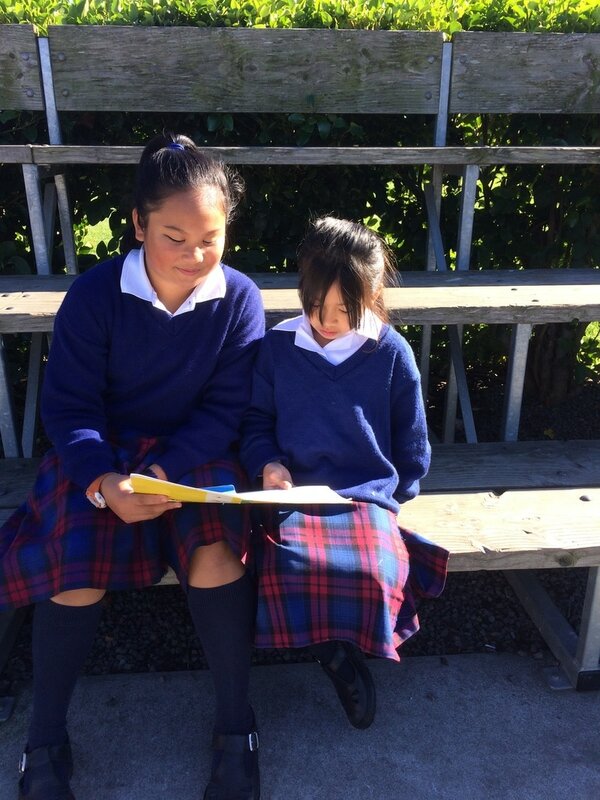 It was wonderful to see all of the Kiwi 8 students back at school today, ready to learn and organised with their school materials. Thank you for helping them to be prepared for their schooling. We had a busy day getting to know one another. The children also met Kiwi Bird who you will also meet during the school year. ​Have a great week back at school. 1 - Ruler (Please ensure that ruler has both mm & cm on it. Please not bendi/ flexi ruler). Coloured Pencils (If you are purchasing Faber Castelle pencils please save the sticker off the front and bring it to school with you). Please make sure all equipment is stored in a pencil case, as this will need to be transported from room to room. All equipment, except for glue sticks and tissues to be clearly named. It would be great for all books to be covered and named please. 3 Scrapbooks for Maths and Religious Education. The cost of $6.00 will be charged to your Student Account for the cost of the scrapbooks. School Will Resume on Monday 30th January 2017 at 8:55 a.m.